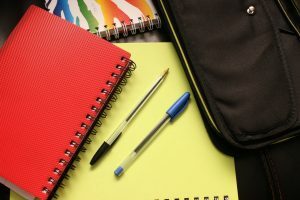 With more and more students opting to take their course online, there’s a learning curve when it comes to buying school supplies. Of course, you’re going to need an internet connection and a device that connects you to the World Wide Web, but there are a number of other supplies that many first time online course takers don’t think about until after the fact. In this article we’ll go over our list of five school supplies online students need. Spending all your online course time on the couch or in bed isn’t going to do you or your back any favours. And because you’ll likely be spending quite a bit of time in your chair of choice, it should be something comfortable. You don’t necessarily need to go out and buy yourself the most expensive office chair, but make sure you having something sturdy that allows you to use your computer in comfort. Having a good set of headphones or earbuds will make your classes that much easier. You won’t have to worry about trying to decipher the noise coming out of your laptop speakers, nor will you be disturbing anyone who may be sitting in the vicinity, but not taking the course. Headphones can also help minimize outside distractions. A printer may not be absolutely required for your courses, but you’ll soon find that it definitely comes in handy. Being able to print documents at will makes it easier to review notes later and also lets you keep physical copies of assignments and lecture notes. There’s nothing worse than trying to get something done and having the internet or electricity kick out. Having a physical calendar on your wall will provide you with an instant, easily referable timeline for everything related to your course. Having your deadline and assignment due dates spread around over a number of documents throughout your computer increases the chances that something will fall through the cracks. Consolidate everything into one place and put it where you can always see it. Even though you may not end up with the same amount of paperwork as you would in a traditional classroom, you will definitely have some. Keep these papers organized in a system of file folders to prevent yourself from ending up with a unorganized mound of paper. A few file folders can keep the related bits together.